Let’s explore the meaning of love, the ideas held by ancient philosophers, and what it means in our modern world. Come to join the discussion over a 3-course meal, glass of wine and tea/coffee. Bookings essential. Limited Places. Book now! 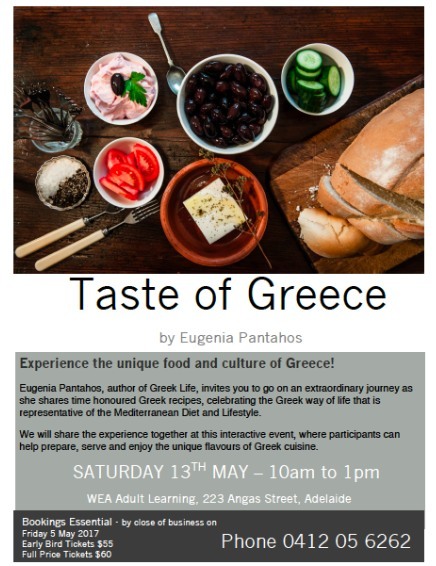 Sydney, I’m bringing you a Taste of Greece! 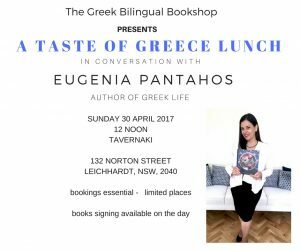 I’ll be in Sydney on Sunday 30 April 2017 to discuss the inspiration behind my book Greek Life. 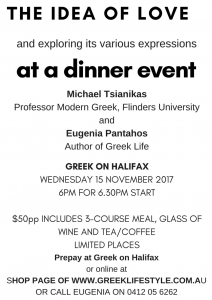 Eleni from the Greek Bilingual Bookshop is the organiser of this event, and I’m truly thrilled to be coming to this beautiful city and to share the story behind Greek Life at the Tavernaki at Leichhardt. Join me at this Family Friendly Event! Bring your family and friends, and join in the celebration over a delicious meal! 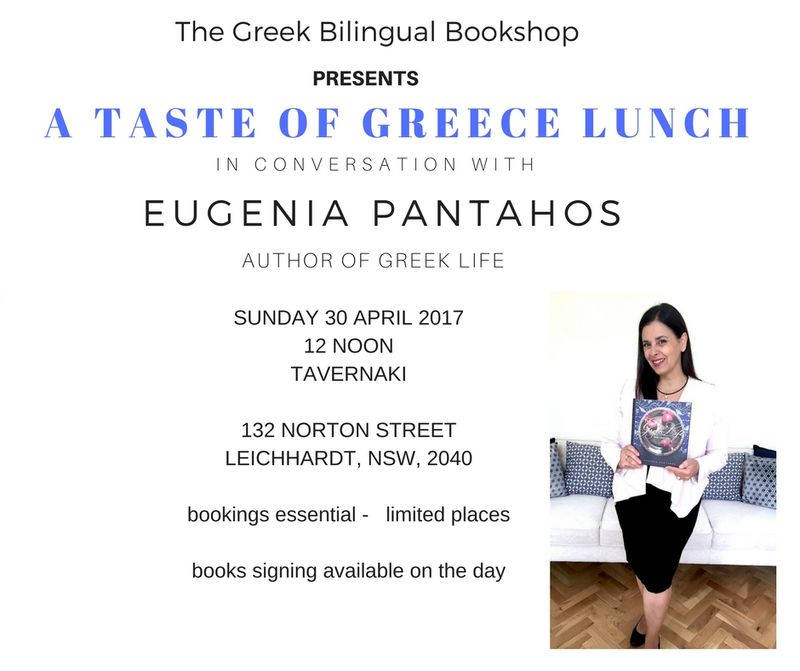 Book at events@greekbilingualbookshop.com.au with your name, number of people attending, and any dietary requirements. A confirmation reply will be sent. Price is between $35 and $40 per person and includes a 3 course meal and glass of wine. There is no extra charge for children sharing with parents. Drinks extra. Enjoy the flavors of Greece at this authentic Taste of Greece cooking class. You’ve asked for it, and I’m happy to deliver! 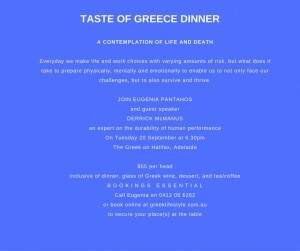 A Taste of Greece right here in Adelaide! 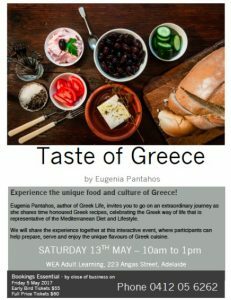 This Mother’s Day spoil yourself and your mum with a Taste of Greece cooking experience right here in Adelaide. Take advantage of the Early Bird Registration before 26 April 2017 and Full Price registration by 5 May 2017. Mother always said it was nice to share…so please do share this post with your family, friends, and colleagues. Bookings are essential as places are limited. Book here. 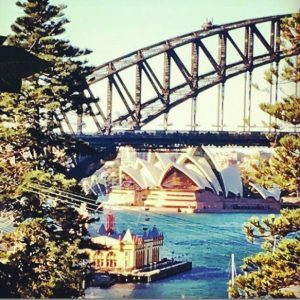 I’m looking forward to seeing you in Sydney at the Tavernaki on Sunday 30th April at this Family Friendly Event. Bring your family and friends and join in the discussion and celebration around my book Greek Life over delicious Greek food, great company, and inspiring conversation. 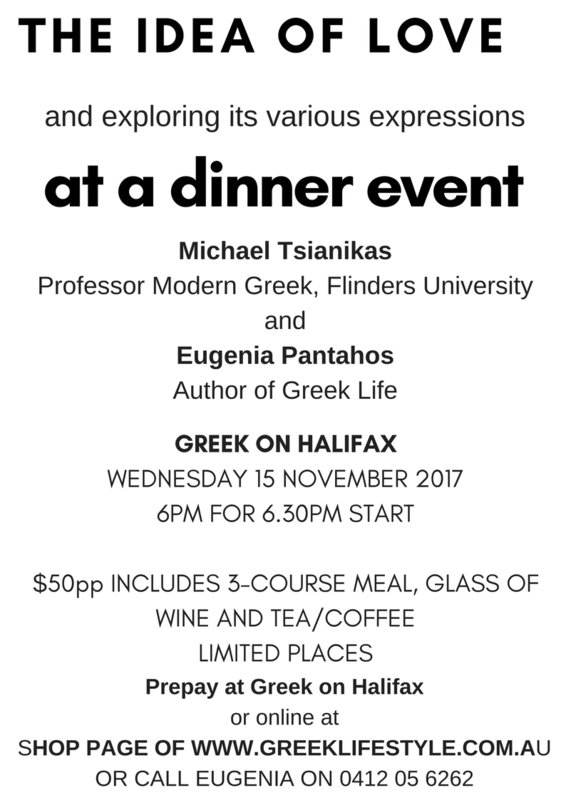 Book your tickets by either calling Eleni on mobile number 95594424 or email events@greekbilingualbookshop.com.au with your name, number of people attending, and any dietary requirements. A confirmation email will be sent to you. Together we will enjoy a 3-course meal and glass of wine for a very reasonable cost of between $35 and $40 per person. As you would expect from a Family Friendly Event, there is no extra charge for young children sharing with parents. Drinks of course are extra. 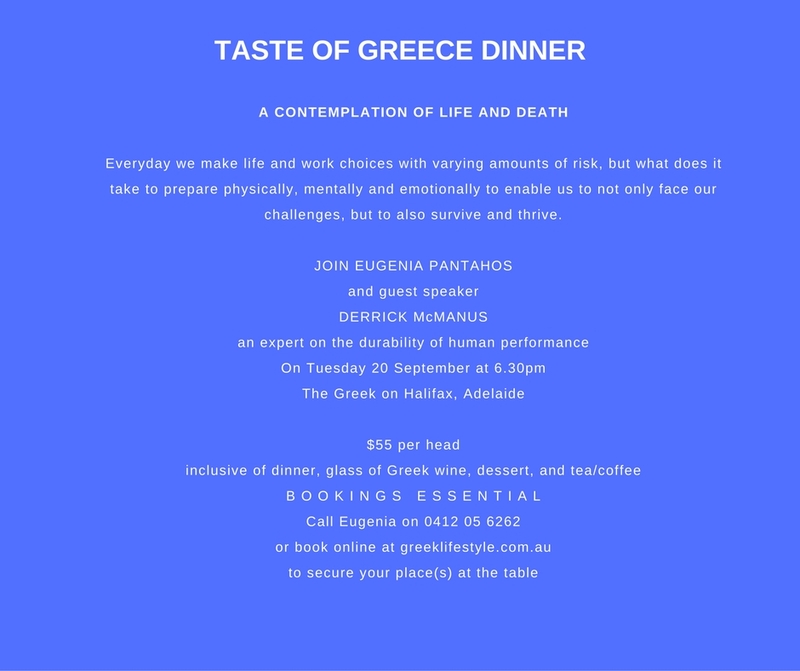 You’re invited to my next Taste of Greece dinner on Tuesday 20 September at 6.30pm for a 7pm start at the Greek on Halifax, Adelaide. You won’t want to miss out on this inspiring discussion on a Contemplation of Life and Death with the highly acclaimed international speaker Derrick McMannus.